If you’ve been keeping up with our blog over the past few months, then you’ve seen our posts on questions about your bedroom, bathroom, kitchen, and dining room lighting. 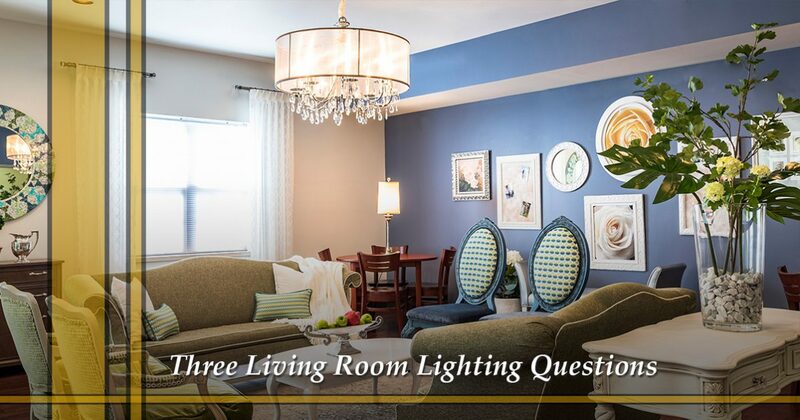 We hope that you’ve found some insights on how you can improve the lighting in your home, and in this post, we’ll cover perhaps the most important room in your house – the living room. At Passion Lighting in Grapevine, we love helping people find new living room lighting. From the main fixture or fan on the ceiling to the sconces on the wall and the lamps on the end tables, we can provide you with an outstanding selection. 1. Do I Have the Right Lights for Entertaining? The living room is where people hang out when you have a party, especially if it’s an informal gathering. You want the lighting to be right for entertaining, which means you need fixtures for each seating area, as well as the right lights for watching TV or movies. If all you have is a general overhead fixture or a single ceiling fan with a light kit, then you might want to think about how you can add table and floor lamps and other accent fixtures to create a more inviting room. 2. Is the Room Too Bright? Your living room should be appealing, and bright lights can help you accentuate the design and architecture of the space. However, you don’t want the room to be so bright that it becomes overpowering. Balancing light and shadow will make the room more dramatic, and installing dimmer switches will help you set the appropriate mood when you’re hosting a party or sitting down to watch a movie. You want each area of the room to have the proper lighting, but you don’t want so much illumination that the room is no longer comfortable. 3. Are My Light Fixtures Outdated? Your lighting and decor styles can say a lot about you, and if you’re feeling self-conscious about the fixtures in your living room, then it might be time for an upgrade. Since the living room is where people gather when they visit, and it’s often the only room they really see, then it’s important to have fixture styles that express modern sensibilities. A semi-flush fixture from the 1980s can be a conversation starter, but it might not be the conversation that you want to have. At Passion Lighting, we can help you find the right lights for entertaining, dimmer switches that help you balance the living room, and new styles that update your home’s personality. Our showroom is filled with thousands of options, and our expert staff can guide you through the decision process. Contact us online today, call us at (866) 226-6555, or visit our showroom at 1649 W Northwest Highway in Grapevine. We’re here Monday through Saturday, and we’d love nothing more than to help you discover new living room lighting. If you have other questions besides the three above, then please don’t hesitate to ask.